Bruce Reeves – Pride Houston, Inc.
Bruce Reeves is a new Member-at-Large of Pride Houston. Born in Mississippi many years ago. He graduated with a Bachelors of Computer Science in 1980 from Mississippi State University and moved to Houston. He came out in 1984 in his process of transferring to Baton Rouge and moved back to Houston in 1986. Bruce remembers attending his first pride celebrations in the summer of 86 when he attended parades in San Francisco and Seattle. The following year, Bruce became involved in Houston Gay & Lesbian Pride, and in 1988, Bruce was male co-chair with Deborah Bell of Houston Lesbian & Gay Pride. Over the years, Bruce has been involved in many organizations. Currently, he also serves as treasurer of Gulf Coast Archive & Museum of GLBT History and is the current reigning King Olympus XLVIII. He is also currently a member of Four Seasons Club, Prime Timers Houston and Lone Star Nudist Group. Bruce is married to Mario Moreno, originally of Reynosa, Mexico. They live in Third Ward with their two chihuahuas Kevin and Luna. 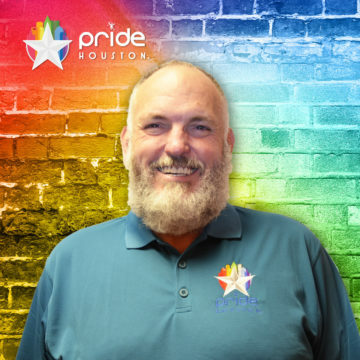 Bruce is happy to be a part of Houston Pride again and is looking forward to doing everything he can for the organization.